The helmet was intended for ceremonial wear and for display as a work of art, rather than for use in battle. It depicts scenes from ancient Rome with monstrous animals, combats and military trophies. 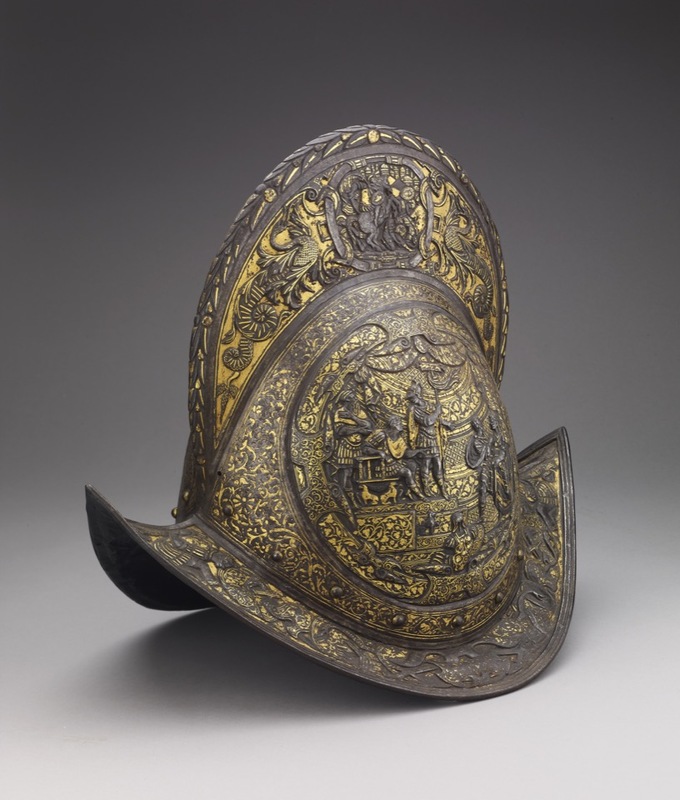 Iron morion; embossed, chased and inlaid with gold; on crest: combats of horsemen between pairs of monstrous animals; on each side of the body a Roman scene; trophies and figures on the brim. This object sits in the centre of two cases, visible from both sides. Provenance: Probably Baron Anselm von Rothschild, Vienna, between 1866 and 1872 (probably cat no. 526, but catalogue description not conclusive), probably by inheritance to his son Baron Ferdinand Rothschild (d. 1898). Commentary: This helmet was intended for ceremonial wear and display rather than for use in battle. It depicts classical scenes of Roman combat along with monstrous animals and military trophies. It was probably inherited by Baron Ferdinand Rothschild from his father’s collection, although the description in his father’s catalogue is too vague to be certain of this. Compare with morions in the Wallace Collection (inv. no. A120) and Paris Musée de l'Armée (inv. no. H/184). J.Godoy & S. Leydi, 'Parures Triumphales, Le maniérisme dans l'art de l'armure italienne', exhibition catalogue, Musées d'art et d'histoire, Geneva, 2003, p. 184.